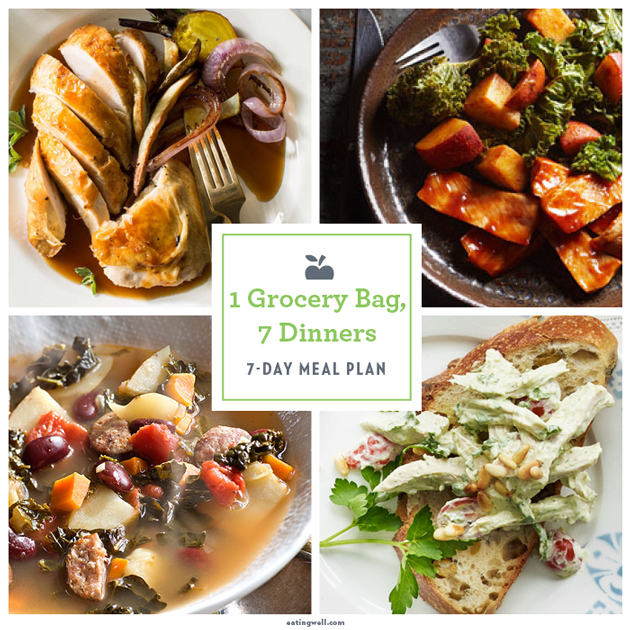 With a well stocked pantry and this week's meal plan in hand, you'll find yourself walking out of the grocery store with just one bag of goods, rather than a carload. This week's meal plan features recipes that use and reuse pantry staples and fresh ingredients in creative ways for 7-days of delicious, simple, and satisfying dinners. Repurpose leftovers from the Roasted Chicken with Pan Gravy recipe in the flavorful Italian Pesto Chicken Salad later in the week. Cook extra rice when making the Quick Risotto with Shrimp, Corn & Edemame to use for the Dijon Salmon with Green Bean Pilaf dinner a few days later. At the end of the week use up remaining vegetables, such as carrots, kale and potatoes, in the veggie-packed Portuguese Kale & Red Bean Soup. This thrifty meal plan will help you get stress-free dinners on the table easily every night this week. Download a BONUS 1-Week Dinner Plan & Shopping List for 5 Fast Fall Dinner Recipes from One Bag of Groceries! 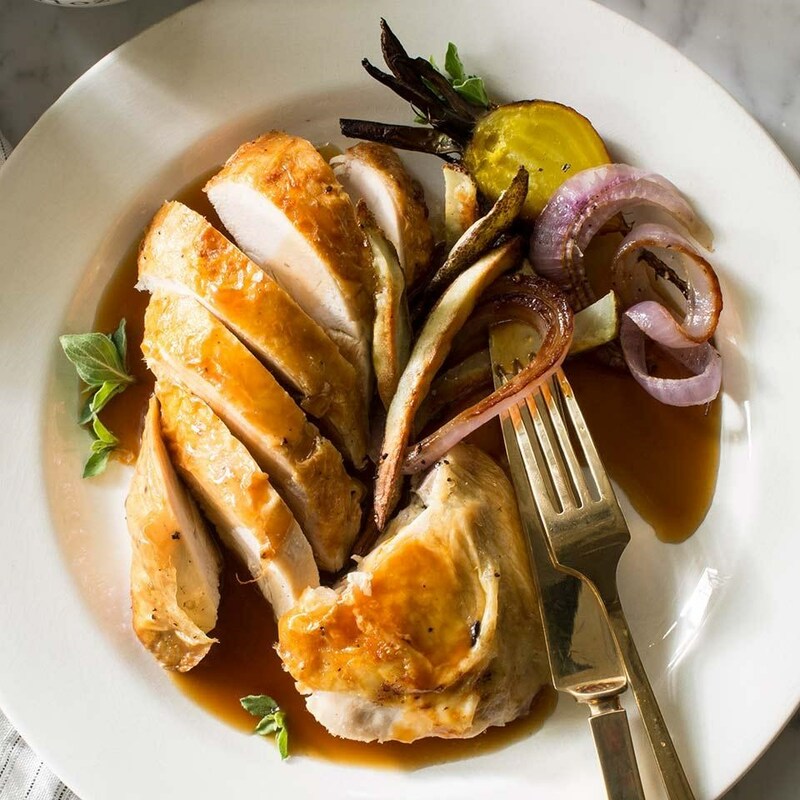 Roasted Chicken with Pan Gravy: In this easy roast chicken recipe, onions, carrots and celery cook underneath and soak up the juices from the roasting bird. The delicious vegetables are then used to make easy, healthy gravy. Serve this dish with a big green salad with vinaigrette. Ravioli with Arugula & Pecorino: Elevate frozen ravioli with sizzled garlic and shallots, shaved cheese and fresh arugula. If you don't want to buy Pecorino and Parmesan cheese this week, get just the Parmesan to use in this recipe—you'll use it again in tomorrow night's dinner and will use the arugula again on day four. 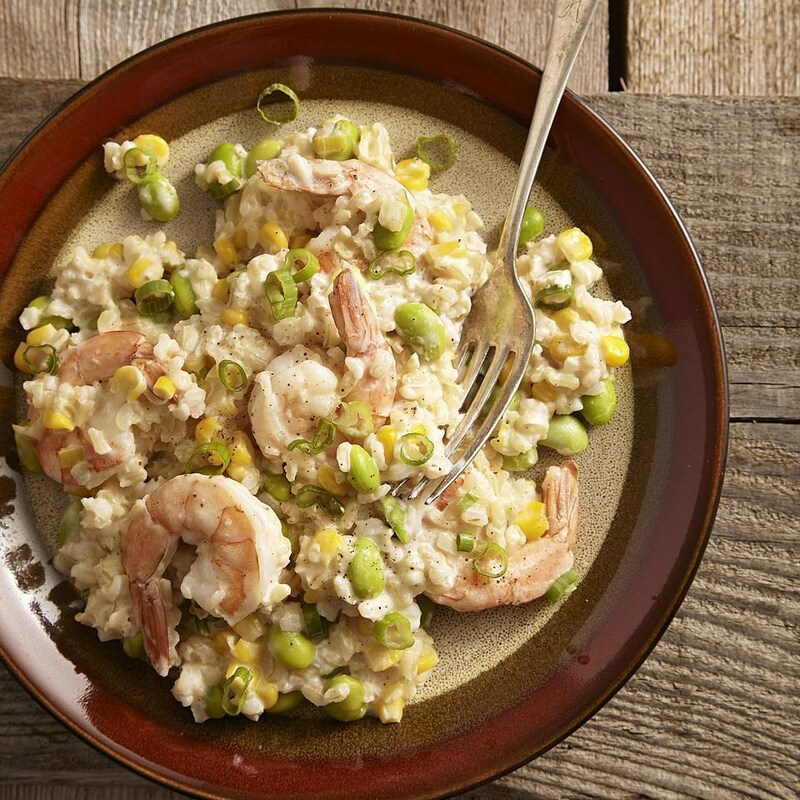 Quick Risotto with Shrimp, Corn & Edemame: In this healthy, quick risotto recipe, we use instant brown rice instead of arborio rice, and frozen corn and edamame to speed up the cooking time and add fiber. To get the creamy risotto texture without slow cooking, we stir in cream cheese and Parmesan just at the end of cooking. To save some time later in the week, you can cook extra rice tonight and save it for dinner on day five. Toss the extra corn and edamame back in the freezer to use again in future recipes. 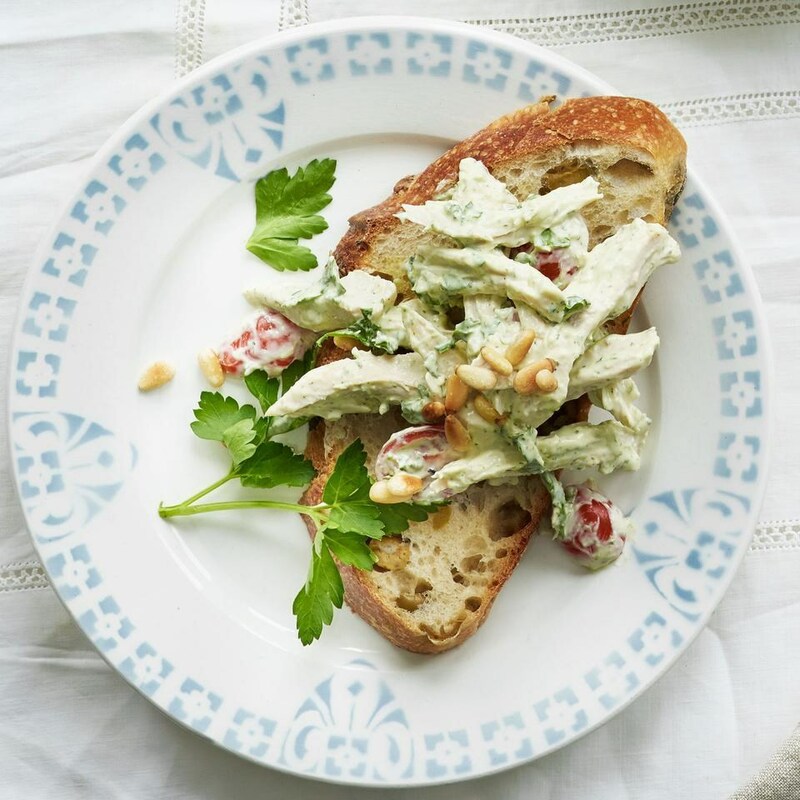 Italian Pesto Chicken Salad: Prepared pesto is the secret ingredient in this lightened-up, healthy creamy chicken salad recipe. For the prettiest dressing, go for a bright-green colored pesto. Prep time is kept to a minimum when you use the leftover chicken from day one. Serve the salad open-face on toasted bread or scoop it on top of fresh salad greens. Barbecued Pork Chops with Roasted Potatoes & Kale: Cooking the potatoes and kale in a foil packet in this healthy recipe gives you moist and tender results while using less oil. Choose a barbecue sauce that has the least amount of sodium and added sugars. You'll use potatoes and kale again in a hearty soup later in the week. 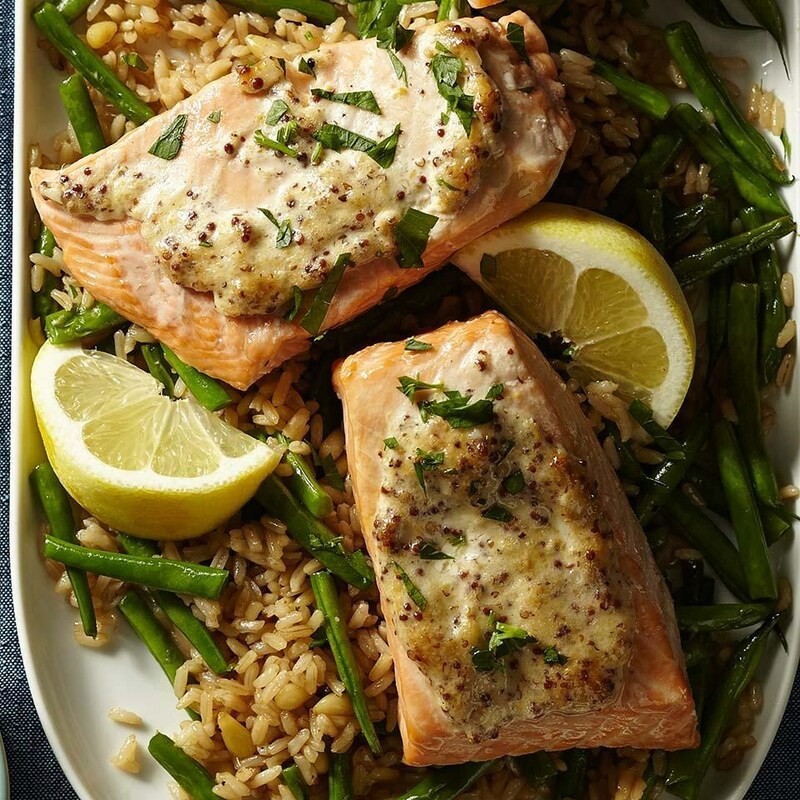 Dijon Salmon with Green Bean Pilaf: In this quick dinner recipe, the delicious garlicky-mustardy mayo that tops baked salmon is very versatile. Make extra to use as a dip for fries or to jazz up tuna salad. Using the extra rice you cooked earlier in the week helps get this healthy dinner on the table fast. 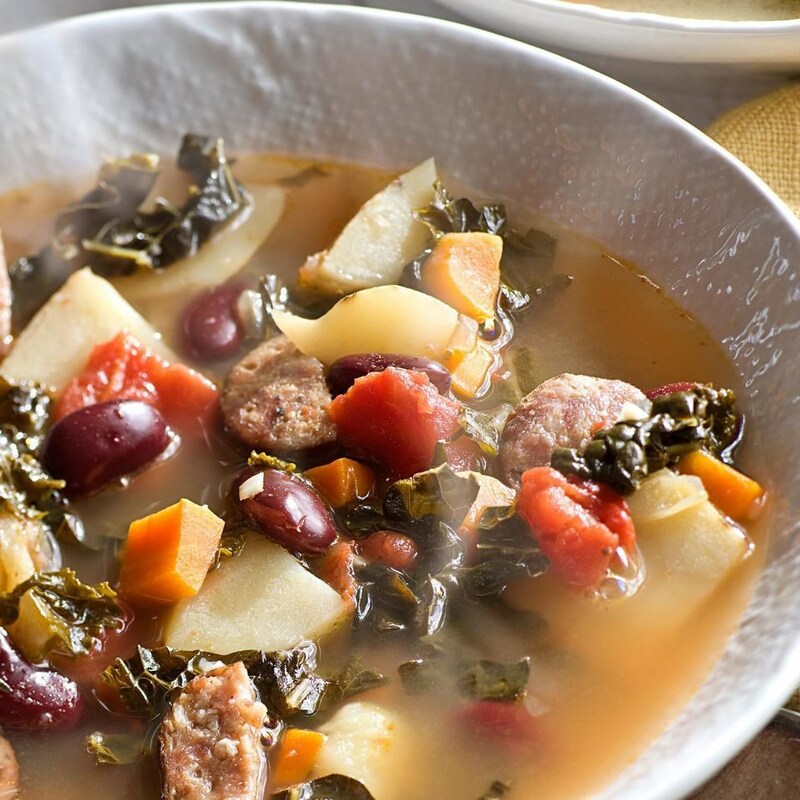 Portuguese Kale & Red Bean Soup: This vegetable-packed healthy soup recipe uses up vegetables from earlier recipes (kale, potatoes and carrots), so you don't have to buy tons of different produce this week. We added protein-rich kidney beans, canned tomatoes and savory sausage to make for a hearty and satisfying dinner.